See what others are saying about America On Wheels Museum on Trip Advisor. If you have visited the Museum we’d love to hear from you and your feedback is very important to us, submit your testimonials here. was lifted” I was honored to bring this message. Your son played beautifully and a group of us plan to attend one of his local shows. Many Blessings on living Beautiful everyday. You are the best for helping us have a great party for Joe while also staying within our budget! THANK YOU THANK YOU THANK YOU!!! The Allentown AARP Chapter #5415 would like to thank Jeff Tintle of Lifestyles Over 50 Magazine for his invitation to the Reader Appreciation Event at America On Wheels Museum held on May 28th. Many of our members took advantage of the invitation and were there to tour the Museum. I was personally impressed with the Woodies and also happy the Cafe was open, where I enjoyed a hot dog and root beer float, my favorite from the 50’s. I am sure that when some of our members saw this exhibit for the first time, they will be repeaters and I do hear from some that when they get out of town guests, this is one of the places that they will take their guests. Perhaps the rain cut down the attendance to this invite, but those that did come out were pleasantly entertained. America on Wheels has a variety of cars, trucks, bikes, motorcycles, and pedal cars. They are attractively displayed against large murals with posters, mannequins, tools, and even a statue adding to the display. The signage was informative. There were interactive displays with a Mack truck to “drive”, wood blocks with questions to answer, and headphone wands. I particularly enjoyed the restoration area, the street scene with the garage, and the Mack truck display. We tried out the “Hub Cap Café” with its restored soda fountain. Everything was neat and clean and the cars had been dusted. What made it particularly special were the volunteers. We were lucky enough to have a volunteer move from area to area with us and my Dad particularly enjoyed talking with him and sharing their love of cars and car museums. America on Wheels is an exceptionally teacher friendly field trip experience. The lesson plans are streamlined and written to PA standards. The presenters are knowledgeable and student friendly. The atmosphere is nostalgic. It is an Allentown jewel. I highly recommend America on Wheels as an educational destination for every child and child at heart. Linda – What a great tour. Walt Weaver did a really nice job. The students were really excited. Taking pictures, playing the juke box, loved it. We are really giving them a flavor of Allentown and the Lehigh Valley. These are students who, other than visiting Muhlenberg, have never been to Allentown. And they are loving it. Linda, I want to thank you again, for allowing us to share our Red E Fox 9-1-1 program with your guests at the museum. This is the 3rd year that we have been involved in this event and it continues to get better every year!. There was a great turn out and we made lots of contacts with the children of the community. You have a wonderful organization that is certainly an asset to the City of Allentown our residents, and visitors. 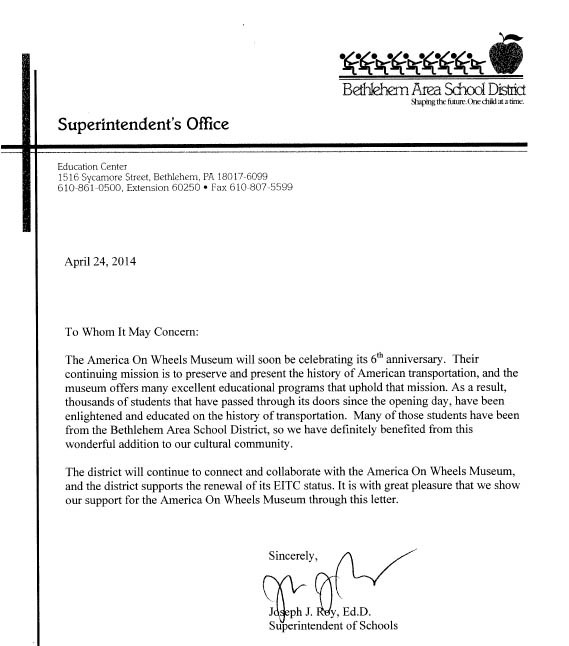 Thank you again for allowing us to participate. Please keep us in mind for future events. Years ago I can recall admiring the meatpacking building, that the museum now occupies, from the road. So much so I actually got out of my car and walked around it thinking what a great building for something really special. Just toured the museum and then had the opportunity to speak with Linda Merkel, the director. America On Wheels is truly redefining what museums mean to a community. A special group of people who care about their organization and the community of Allentown. We visited your museum this past Wednesday and had such a wonderful time! Our 11 year old son had a blast taking pictures of all the old cars, our 8 year old copied about 12 license plates upstairs and our 5 year old put about 100 miles on the Mack truck! Then, they all enjoyed coloring in the coloring books when we got home. Your museum is kid-friendly, adult informative (Yes, I do want to know why I can’t fix my car anymore…) and an all around pleasure to visit. Thank you! I would like to thank you and your staff for the great day at the Cars 2 World Tour. It meant alot to us to see the look on our daughter’s face when she got to see her favorite movie characters up close. My wife and I both agreed it was well put together and extremely well organized for the mass amount of people that arrived. Thank you so very much from my wife, myself, and especially my daughter. Thank you for allowing us to share our Red E. Fox / 9-1-1 Public Education Program with your guests at the Child Safety Day event today. The turnout was fantastic and we were able to make many contacts with the children that attended. You and your staff should be very proud of the facility and programs that you have developed. The museum is certainly an asset to the citizens and the City of Allentown. Thank you again for allowing us to participate in your event. Please keep us in mind for other similar programs. On behalf of Volvo Sports America, I want to thank you for your hospitality this past weekend. Our membership enjoyed a wonderful day at the museum. I heard many compliments from the membership in attendance about your displays. The staff accommodated our every need. I cannot say enough about their courtesy to VSA. Liz you were a big help in bringing this to reality and it was a pleasure to work with you. Linda Merkel was there to greet us Saturday morning, and to assure everything went smoothly for us. We hope this was an equally enjoyable experience for America on Wheels. I can foresee us coming back in the future. 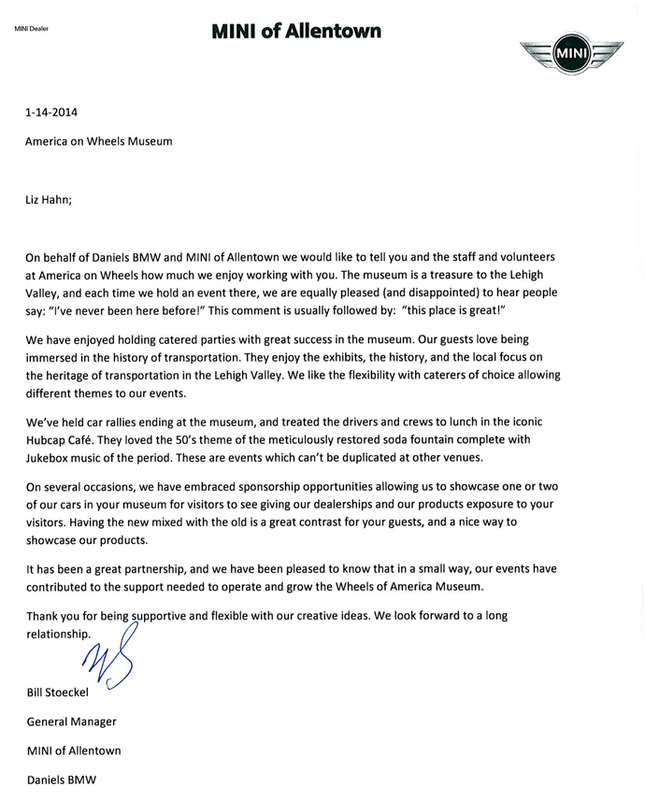 I know our members will be good will ambassadors for the museum, and spread the good word. Liz, again many thanks, and I hope your museum gets the praise it deserves and continues to grow. Liz, and the Docents: Our group thoroughly enjoyed all aspects of the museum. I was pleasantly surprised by the size of the museum and how well modes of transportation were displayed. There was a lot of reminiscing occurring as we viewed the exhibits. A special thanks is extended to the docents whose knowledge of the subject gave excellent and fascinating information. I am so pleased that we had this opportunity. Dear Linda, Thank you for the excellent tour and experience that you and your staff provided to our VIP guests from China. They commented very favorably on the museum, in particular the 1930 Hupmobile. Pete was a great tour guide for us and the entire morning went very well. I enjoyed the museum myself and will try to figure a way to get my father in law there as well. Overall a very good experience – thanks from all of us at MINTEQ. Hi Liz – This is just a quick thank you for all your help with our event last Tuesday. You have a beautiful site with fascinating displays which our guests enjoyed tremendously. Even more important, all of the staff (especially you, Linda, and Paul) seemed ready to help and focused on service. On behalf of all the staff at ABC and our members who attended the banquet, thank you very much for making sure we had a positive and memorable evening. I just wanted to thank you for the opportunity to work with America on Wheels for our fundraiser. Those who attended really enjoyed the opportunity to visit the museum. I have visited Greenfield Village many times in Detroit and was wondering how America on Wheels could tell the auto industry story locally. Well, you have certainly done a great job!!! Your well informed and friendly volunteers helped make the exhibition come alive and are excellent. Thanks you for partnering with us. I certainly will visit again when my grandchildren are in town from Ohio. It was a pleasure to host the reception at America on Wheels. I will spread the word about how easy it was to work with you, and your team, and how much our guests loved the exhibits. We will definitely be doing another event there. I just wanted to thank you and the “Party Crew”, including the women behind the counter, who helped make Abby’s birthday such a great day! Abby absolutely LOVES her birthday. She had been looking forward to this party for months! We couldn’t have been happier with Zach, Bob and Gary! They all had such great personalities to go with this event. I was so impressed with the age appropriateness of the events. The tour was enough information for the adults to keep interest and at the same time not too much to overwhelm the kids. All the kids had a blast with the scavenger hunt too! The Hub Cafe was perfect for the pizza party and to have cake too. The kids enjoyed the jukebox very much. As a parent, it was nice to have this party at a venue where we didn’t feel rushed or like “just another party”. I was impressed with how prepared the staff was – the crayon station was all ready for us when we got there. Our younger guys very much appreciated the cars and the ramp. I’ve attached a picture for you of the kids enjoying their pizza! I just wanted to say thank you so much for everything today! It was an amazing day for my dad. We appreciate all your help! I would definitely recommend the facility to others looking for a place to have a party! We had a GREAT time on Saturday and the compliments keep pouring in from our friends and family about the museum. I am so glad they decided to have the wedding there. Thank you so much for all of your help and the wonderful help of the volunteers in making the night extra special. The Café was a fantastic backdrop for everything and the bar became the gathering place for everyone to sit and chat. I hope we were not too much bother with set up / clean up. I appreciate all of the help. I just received my June 2016 issue of the New England MG T Register’s “Sacred Octagon” magazine. I was hoping to see some coverage of the Kimber Festival in it, but was amazed to see 14 pages covering it! Lots of photos with it – including the two MGs of Mike and Art on display at AOW for it. Ken Beck got a whole page of coverage for his “Wheel Shake” presentation there. Nice photos of AOW! This all reflects well on the Keystone Region MG Club, and AOW. It was a great event for everyone!